The area directly around Mabuasehube. Previously hunting area but now open for tourism and no fences between here and the Kgalagadi Transfrontier Park. but now open for tourism. 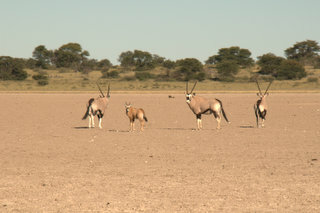 It is an area adjoining the Mabuasehube-Kgalagadi Transfrontier Park, there are no fences and no other people. The earmark of this area is that the owner of the concession wants to keep it as wild and exclusive as possible, allowing only a couple of small guided groups per year. Guided tours only by a selected few tour operators such as VIROSATOURS, otherwise a highly restricted area. 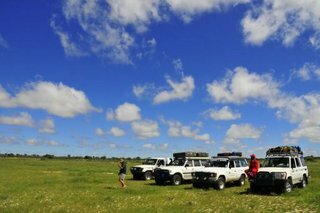 We run safari's into the area on a weekly basis, where you start on Saturday evening at Cornwall ranch and end during the next week. Guided with wild animal tracker. 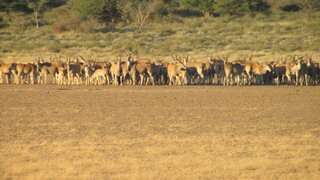 Plenty of other game; Eland, Gemsbok, Blue wildebeest, Red Hartebeest, Springbok and also smaller mammals like Honey badger Aardvark etc. I have personally seen 15000 Springbok and 400 Eland. No extensive driving; will set camp at about 16:00; allowing you to explore a bit and enjoying the sunset. These are really wild animals; hardly any human encounters. The trip will start on any given Saturday at Cornwall House near the Bray border control, where the first night will be spent. 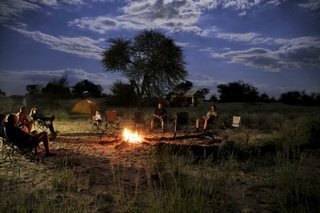 Camping R300-00pp Dinner bed breakfast included. Lodging R500-00pp Dinner bed breakfast included. 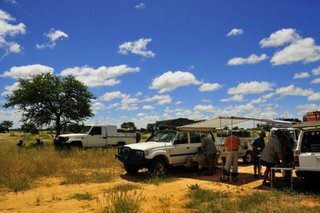 From Cornwall we travel to the concession area that is situated around the Mabuasehube camp. Will then travel in a circular route through the area depending on where the game is at that stage. and setting camp at around 16h00, from where you may explore a bit and go for a sunset drive. We then make a huge communal Kalahari fire. In case of emergency will be able to refill our water supplies at the Mabuasehube gate. The trip will end on the given day and there will be time to drive home or make the border.. Carry at least 75l water. Supply own instant breakfast (coffee and rusks) and light lunch. We do these tours for nature loving and caring people, it is not so much about the wildlife but more about being out there with them. We have the option of partially being catered for or fully self sufficient. Self catered: R2800-00-00per person. Excl accommodation at Cornwall Ranch. Evening meals catered: R3800-00per person. Excl accommodation at Cornwall Ranch. Under 7 years, free of charge, but you supply their own food, no meals included, if you want meals for them an aditional R90-00pp per day to be charged. Between 7 years and 15 years, half price. Older than 15, same as normal person, ie full price.